So glad I know this girl….truly a genuine heart for God! I couldn’t help but share it! What a powerful story, Robyn. Thanks for sharing and thanks for championing the heart of God and the needs of waiting children. We’re cheering for you! Robyn in her forever family. I am walking because I believe in forever families. 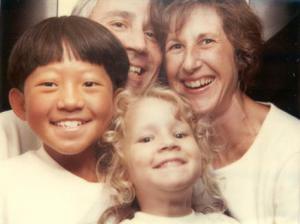 My family was created through adoption. My brother was adopted at 8 months old from South Korea after being abandoned. He was the beginning of my forever family. I was put up for adoption at birth and was blessed with my forever family at 3 days old.